It’s mid-April and here in the northern hemisphere the calendar says it’s spring. One look out our windows here in Toronto, however, tells a whole different story. We’ve been in the grips of a late-season ice storm for the past few days and it could not look more like winter out there. What better time to be thinking of Hong Kong and its current 25° C temperatures! We’ve been actively planning this Asia trip for some time. It all began some time last year when, despite Asia having been on our travel bucket list for some time, we mused that perhaps we didn’t really need that 15-hour flight. When our son got wind of our thoughts on the subject he implored us not to give up the idea. In his view we HAD to visit Hong Kong and Tokyo at least. He had performed in both cities on various tours with Les Ballets de Monte Carlo a few years ago and told us that we’d love both experiences. So, we decided to take his advice and plan a trip that would include both. It was just the two of us and Kevin, our guide, in his Mercedes when we toured Ireland a few years ago. Here is our transportation parked out front of Ashford Castle. We looked at land-tour options and those included a number of regional flights in China. We wondered if we really wanted to spend that much time in airports where we didn’t speak the language, and worse, couldn’t even read the language characters. That seemed like a bit of a drag to us, although we considered a Kensington private, guided tour, since we had used them before in Ireland and were more than satisfied. But there were other options. We could consider transportation between cities by ship. As long-time readers know about us, cruise ships are really just comfortable methods of transportation for us usually. Okay, we sometimes do like an island hop in the Caribbean on a six-star ship, but in recent years, our “cruises” have been selected based on their itineraries. So, we decided to check out our favourite cruise lines to see what they offered in Asia. Silversea was the only one we found that began in Hong Kong and ended in Tokyo. That was perfect: we could spend a few days in Hong Kong before sailing, then end with four or five days in Tokyo. So, we booked. One of the nice features of this itinerary was also that the ship spends two days in each of the important ports of call: Shanghai, Beijing, Osaka. It also offers a couple of mid-cruise land tours where you leave the ship for an overnight on shore so that you can explore places you couldn’t do in a single day. Next on the agenda – right after touching base with our long-time travel agent Angela (Maritime Travel) who booked our non-stop flights to and from our destination – was to plan how we would see the sights. First, we looked at the cruise line’s own offerings. We decided to book their overland trip in Beijing. When the ship docks in Tianjin (the port for Beijing) we’ll be on the fast train into the city for touring. Then we stay overnight at the Four Season’s Hotel in Beijing. The next day we head to The Great Wall then back to meet the ship. Unlike the shore excursions which, on Silversea, you book in advance but pay for when you disembark the ship, this overland trip had to be paid for in advance. Done. As we looked at the other offerings, it occurred to us that there were choices among them that would permit us to see as much of the stops as possible. So, we booked a number of excursions. Silversea’s shore excursions, in our experience, appear expensive to the untrained eye, but they do have fewer people on buses and are generally good value for the money. That took care of planning for Shanghai, Hiroshima, Osaka and Kyoto. That left us with our book-ends: Hong Kong and Tokyo. Naturally we looked to Tours-by-Locals, our go-to company for private touring around the world. Our private guide in Hong Kong has now arranged our transportation from the airport to our hotel on Hong Kong island, will provide us with a private tour of the city and arrange for our transportation to the pier. Our Tokyo guide has arranged three days of city touring and a day of touring outside the city – then will drop us at the airport after four days there. And all of this was arranged through Tours-by-Locals’ web site where we were able to arrange all the details which are personalized for us. Our Tokyo guide has even provided us with materials to help us acclimatize to Japanese culture as well as an extensive list of recommended reading. Well, we opted to prepare for this trip not through too much reading, but via two video-based courses. We bought two courses from The Great Courses, a site that we’ve gone to throughout the years for a wide variety of educational programming: Foundations of Eastern Civilization (Craig G. Benjamin PhD), which was 48 half-hour lectures and Understanding Japan: A Cultural History (Mark J. Ravina PhD), 24 half-hour lectures. And yes, we watched every one of them. Both professors are experts in their fields, but more important perhaps even than that is that their passion for their respective specialties is palpable in their terrific delivery. We didn’t take notes, but we feel that having done this in advance, we can more fully experience the history and culture of our Asian destinations. We’re looking forward to seeing in real life many of the places and experiences both shared with us. Now that we’ve booked and finalized everything, and prepared our brains for new adventures, we’re just about ready to board that plane. We leave in five days. Hope you’ll come along with us! Getting ready…trusty Briggs & Riley carry-ons. There is nothing quite like an extended road trip to teach you a few things about making discerning travel choices. We have just returned from a three-stage trip that took us from Toronto through the Niagara peninsula to upstate New York then on to New Hampshire, New Brunswick and ending up in (stage two) Halifax, Nova Scotia for a five-day stop to visit friends and family. The third stage took us home from Halifax via Nova Scotia’s south shore, St. Andrews, New Brunswick then on to Wentworth-by-the Sea in New Hampshire and Lake Placid NY before arriving back in Toronto. Planning this kind of trip can tax the discernment of even the most seasoned of us! And plan we do. There are road-trippers who can just pack a bag, throw it in the trunk and set off in a direction with little idea of where they might be stopping, eating, sleeping or even ending up. We are not like that. We like new experiences and discovering the delights of new places, but we don’t like to be surprised by our accommodation. This may hearken back to Patty’s childhood when family holidays to visit the grandmother consisted of three or four days in the car punctuated by nights in roadside motels – the kind with those plastic chairs outside of every door and your car parked nose up to your window. And of course the choice was based on which ones had “vacancy” signs out front when her father was tired of driving. Leaves too much to chance for discerning travelers of a certain age. So we conduct our due diligence, plot a course, book the hotels and set out. This time we stayed at a few tried-and-true properties, but opted for some new experiences. We were mostly happy, but at least one of our choices taught us yet new lessons about discernment. As we’ve said before, the discerning traveler is a discriminating traveler. In addition to this, discerning travelers want to be assured that they are getting value for the amount of money that they are willing to pay. Almost always, this pays off in experiences that we truly savour. This time we had one experience that didn’t meet its mark. It’s all a matter of expectations. The story involves two inns in the north-eastern US – one in upstate New York, the other in northern New Hampshire in the White Mountains. The first stop on our road trip was Geneva, New York. A lovely little town located on the northern end of Seneca Lake in the Finger Lakes region of New York, Geneva is home to the beautiful Hobart and William Smith Colleges that meant nothing to us until we realized they are the successor of what used to be Geneva College, including Geneva Medical College. We recognized that as the alma mater of Elizabeth Blackwell, the first woman to receive a medical degree in the US in 1849. The campus is beautiful and the ambience very cultured. We selected Geneva-on-the Lake, a beautiful inn which is, as its name suggests, on the lake. Its history dates to 1910 when it was built as a private residence for a prominent Geneva resident. After the original owner died, his wife and son expanded the original house relying heavily on an aesthetic they had picked up on visits to Italy: it is reminiscent of the Italian Renaissance. In 1949 they sold it to the Capuchin Fathers, a branch of the Franciscan order after which it served as a seminary and monastery until 1974. Remnants of that life are still evident. For four years in the 1970’s it housed Vietnam veterans as well as students, but had periods of abandonment. It was restored to its current state in the early 1980’s and has been a year-round resort ever since. We had booked a small suite and when we arrived we found we had been upgraded to a very large one. Knowing we were booking into an old property, we were nevertheless impressed with the upkeep of the building and especially its environment. The dining room was absolutely perfect, serving truly gourmet fare surrounded by a romantic ambience that included a live harpist. And the grounds were a delight. The expensive price tag was worth it. Then we were on to Saratoga Springs followed by Franconia, New Hampshire where we stayed at inn number two. The Franconia Inn also has a history. Also situated on a large piece of property (in this case evidently 107 acres), this inn dates to 1863 and its focus is on downhill skiing in the nearby Franconia notch area as well as cross-country-skiing and hiking. It also has a stable for horseback riding. We arrived at this inn to be greeted by a slightly sloppy-looking, harried front-desk clerk who was on the phone telling a client that indeed they did have rooms available for that night. When we finally checked in, we had to drag our bags up the front steps (yes, there is a ramp, but it does not lead to anywhere near the driveway and lands in an unpaved parking lot shared by the riding stables), then up a full flight of stairs to the second floor. We had booked what they referred to as a “spacious” room – level three out of four levels they offer (good lord, what must the “cozy” rooms look like?). Anyway, it had no phone to even call the front desk to ask for towels nor did it have a television. This is not a big issue, but it’s the twenty-first century and this is not an ashram hosting a meditation retreat. The bathroom was small and pokey, but worst of all in it was the trickle of water that passed for a shower the next morning. The wallpaper was hideous, but that’s just a taste thing. Then there was the outdoor activity. First, this inn is not located in the kind of place that Geneva-on-the-Lake is. It is a few miles from town on a small highway with its unpaved parking lot across the street. That meant that we’d focus on the walking trails that the front desk clerk told us were out behind the inn. She handed us a map and we were off. Finally, there ws the dining experience. The dining room is billed online as having “intimate candle lit tables” that take in the “spectacular view of the White Mountain landscape.” We’ll grant them that it was a dull and drizzly type of day, but there was absolutely no view whatsoever, and we seem to have missed the intimacy of this room that simply looked like a dining room in an old restaurant. The food was very good, though. Our main issue was with the service. At dinner that evening, there was a line up for seating in the sparsely populated space – there were servers about, but there did not seem to be anyone seating people. The next morning, we encountered the opposite problem: all the servers (three of them) were seating people, but there was no one to take orders. So we sat at our little table and froze for a while, then fled as quickly as possible to get into the car and onto the next stop. The bottom line is that both of these experiences cost almost identical amounts of money (fairly pricey), and yet the experience was totally different. Our money was far better spent in the experience at Geneva than Franconia. The lesson for us: you can plan down to the final detail, then you have to let go and enjoy whatever experience pops up. We just laughed off the whole thing. We look forward to returning to Geneva-on-the-Lake. Franconia Inn we’ll chalk up to experience. Dressing for travel: A superficial consideration, or meaningful message? How we dress when we travel is either a pointless consideration of the vain and frivolous among us, or it’s an important visual message that often conveys much more than we had planned. Discerning travelers know the answer: it is a significant factor in how travelers are perceived abroad. It is also, however – and perhaps even more important in some venues – a powerful influence on how travelers behave. The web is full of articles on how to dress for a long flight, things you should never wear when traveling abroad (usually these are directed toward Americans), do’s and don’t’s of travel dressing, and what seems to be the most searched for type of travel dress piece: how to dress for a cruise. We would suggest that when people search for articles on how to dress for travel in general and cruises in particular, they want to know how to feel comfortable – both physically and psychologically. People who search for these answers care – as do we. During airline travel: First, you need to be comfortable, but that doesn’t mean that you need to look like you just crawled out of bed with a hangover. Looking like you care often has the same effect on other people: they might just care about you should you run into difficulty. You can proclaim the superficiality of taking care when you travel, but there is ample evidence to support the contention that looking your best often helps to be treated well – like it or lump it. There is another important dressing guideline for air travel: dressing for the inevitable security check. We were once rushing through security to make a connection between Canada and the US onward and found ourselves in the security line behind a parent and teen-aged son. Said teen-aged son had clearly not received the memo about what a security screen would entail. He had layers upon layers of clothes that all had to be removed one at a time after going through the metal detector and back out of the metal detector. He had several chains around his neck, a chain holding his wallet to his trousers, and on and on. Not a pretty sight in any event, and we were purple with fury. Touring cities: When we tour cities, we walk. That means footwear is our prime consideration, but it is not the only one. We prefer that our attire not scream “tourist”; this means that our footwear does not under any circumstances consist of white sneakers. Given the plethora of really lovely choices of walking shoes these days, it is puzzling to us how many people continue to wear these monstrosities. If you can afford to travel, you can afford a good-looking pair of walking shoes. As for clothing, it ought to be dictated by the weather and local customs. If you’re visiting Istanbul, for example, regardless of how hot it is, if you want to visit a mosque, you’re going to have to be respectful and dress the part. Check with the local tourist authorities for specifics so that you aren’t surprised by the posted signage. Women visiting conservative cities should always have a scarf in a handbag or around a neck for use as a head and shoulder cover. Dining out: Oh how we wish that dining out was still considered to be a treat to be cherished and prepared for by dressing a bit better than one might at one’s own kitchen table. Of course, it matters what kind of restaurant you’re going to be choosing – fast-food outlets are not restaurants. Wear what you want there! No one will bat an eye. But even if you don’t really care what you wear, it might be fun to see dining out as an actual occasion when you’re traveling. Stepping it up a bit can be entertaining, and at the risk of repeating ourselves, you’ll be treated better. You can protest this as much as you want, but it’s a fact of life. For many people – including maître d’s – dressing up a bit is a sign of respect for self and others. be. Just last week we attended a big musical in downtown Toronto at the Ed Mirvish Theatre and we felt as if we had wandered into the economy section of a cut-rate airline. The truth is that in some parts of the world you’ll actually feel out of place if you don’t dress up a bit – and note that ballets and operas tend to have a more dressed-up audience. We noticed this in London and Sydney at the Opera House in particular. Don’t leave them off your travel lists, though; attending theatre performances in foreign cities is a real pleasure. Obviously, you can wear whatever you want. We have noticed, however, that some people do care how they dress in general and while traveling in particular. If all of this sounds as if you will have to lug multiple suitcases, you won’t. We travel with one suitcase each regardless of the length of the trip –a weekend, one week, five weeks – it matters not. One suitcase. (It will probably be very small for a weekend!). So, we’re in the process of planning a three-part winter trip to flee the Canadian winter for a while in early 2013. We are already booked on our first Seabourn cruise aboard the Seabourn Spirit, and since it leaves from Barbados and ends in St. Martin, it only seemed natural that we’d book-end the cruise with vacations in Barbados and then St. Martin. Can’t wait! But, trying to find the right hotel or resort in which to spend a week or so in each place has proven to have eaten up more time than any of our numerous hotel/resort choices in the past. It occurs to us that it’s at least partly because (a) the resources we have now are almost too-much-information; and (b) the ratings systems are so inconsistent and even, dare we say, capricious. 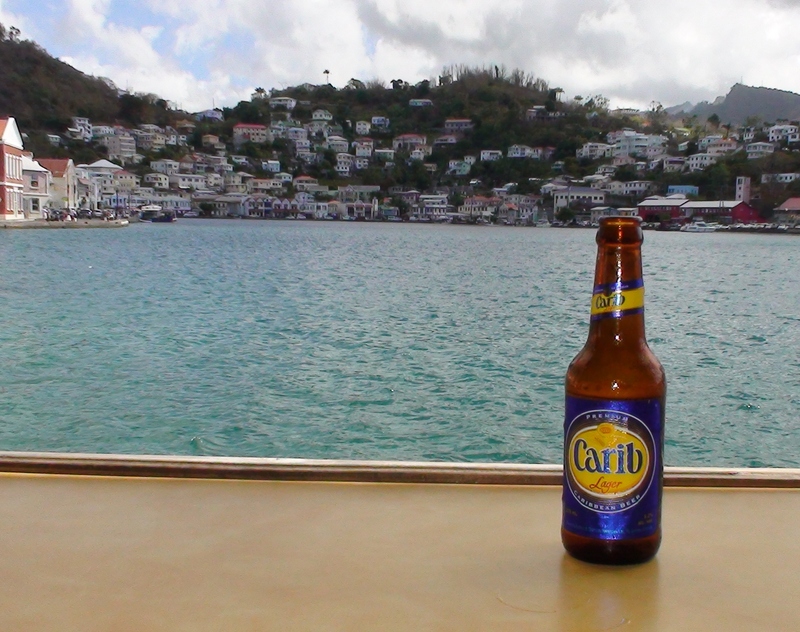 The view from the Ocean Grill in Grenada: Air Canada Vacations was our choice for booking this holiday — and it was a good one! Let’s start where we usually start: namely our favorite hotel aggregator. That would be Air Canada Vacations. We have tended to use ACV in the past because we’re AC frequent fliers and can accumulate points by booking hotel packages through them, even if we’re not actually booking an air-hotel and/or cruise package, all of which can be done. We have also often found that the package rate is better than booking hotels on their own (and we have absolutely no interest in those aggregators like Hotwire where you pay in advance and don’t know exactly where you’ll be staying – you may be able to save money that way, and we’re sure that many people enjoy this. We don’t.). We had a great find in Paris a few years ago. In fact, we have booked our Barbados hotel through ACV. We wanted to experience The House on Barbados and it happened to be among the ACV offerings , and advertises with that enticing descriptor that we love so much: “adults-only.” The rate was competitive and booking this way allows us to put down a deposit and then pay the whole thing in advance (with cancellation insurance, of course). That way our entire holiday is paid for before we go, a feeling that we truly enjoy. But trying to find a hotel in St. Martin was a different thing altogether. To date, we are still not booked for that week of vacation, since somehow our first choice hotel on St. Martin, La Samanna, does not seem to be available any longer (according to our travel agent, and this despite the fact that today when we surfed over to the ACV site, it’s still listed). So, we’re left trying to decipher the hotel rating systems to figure out where we’d like to stay. Air Canada Vacations has their own rating system, and it does not necessarily reflect the systems by any other organizations, or countries for that matter (some countries, predominantly in Europe, have their own rating systems). 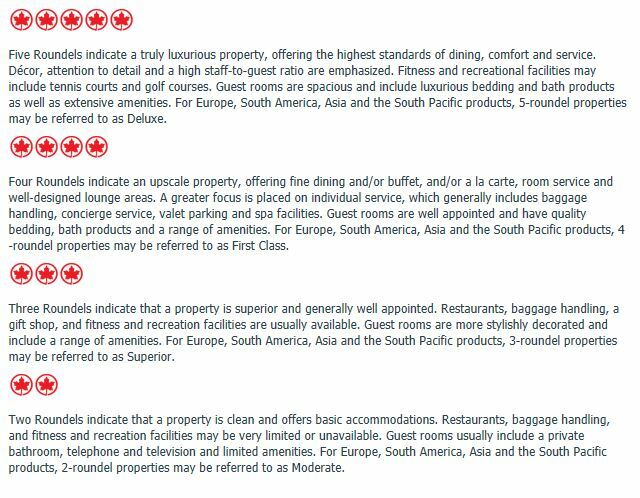 Air Canada Vacations’ Hotel Ratings explained. This explanation is helpful, but the way they rate is not the same as how others rate and we’re left scratching our heads. One of the important considerations in deciphering rating systems is the rating organizations’ reason for doing the rating. Are they trying to sell hotel rooms? Are they a travel advice service only? Or, as is the case so often now in this excess of information age, are they simply allowing people to post their own reviews from which an overall rating is then created? Air Canada Vacations, and others like them, have a vested interest in having these ratings clearly establish certain parameters in the minds of consumers. If they are wrong, or misleading in any way, not only will the customer not book that hotel again, the customer is unlikely to book any of their hotels again. But, of course, sometimes customers disagree with the rater, or have a particularly bad experience that might not be the experience of the majority of others. Then there are the ratings that are assigned by third-party organizations like Forbes. They are not in the business of selling multiple hotel rooms, so their ratings are often viewed as more objective. They have things like anonymous inspectors and consistent criteria that provide you with what is likely to be an overall more accurate rating than, say, customer-generated ratings. For a very good explanation of rating systems, read the CN story The Dirty Truth About Hotel Ratings. We have been reviewing hotels and restaurants on TripAdvisor for a while now, and we do use customer ratings, but recognizing their limitations, we do take them with a grain of salt. We’ve discussed this before, and the overall ratings that come out of customer reviews are often baffling to us. It seems that we are not looking for the same things as many of the reviewers (who are predominantly from the USA, by the way – and this makes a difference). Other customer-generated ratings are published in magazines and on web sites as “readers’ choice” ratings or awards and are even more peculiar since anyone can vote and that anyone need not have ever traveled to more than that single hotel or been on any other cruise line to make a judgment about ‘favorite.’ But that’s a different story. The bottom line is that to the discerning traveler, hotel rating systems are useful, but need to be taken into consideration only with an array of other information you have available to you. So, where does that lead us in our search for the perfect spot to enjoy St. Martin? Exactly nowhere at this stage. We’re still looking!